One of the mainstays of my life-guidance system are the almost imperceptible signs that constantly inform me, you know, the subtle signals or mind gestures from the outside world that somehow catch my attention, flag me down, and lead me within. 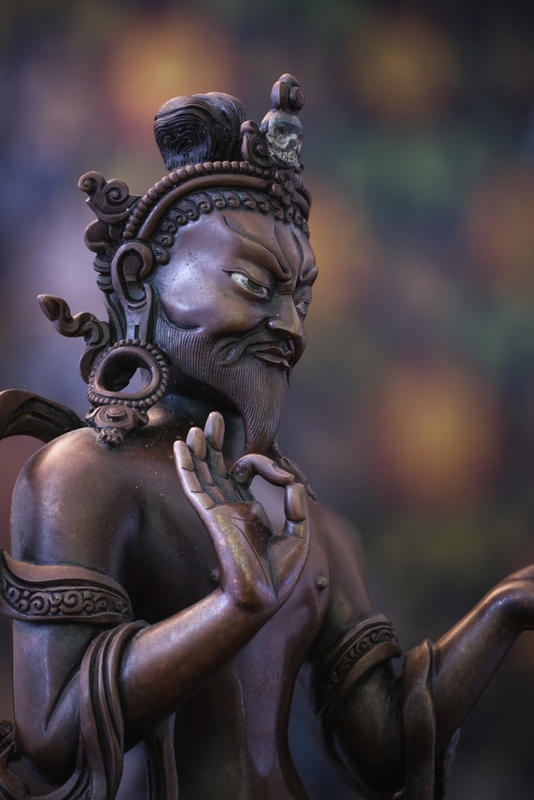 And these are not just natural phenomena, but they also exist in a more organized form in the images of the Buddha and great Bodhisattvas, where these great beings are making mudras, those fascinating sacred hand gestures. But, of course, mudras are not limited to using the hands and, perhaps more important, they are not static and frozen in time, like we see in a drawing or photo. In other words, mudras come and go; they arise and melt away again like the circles that birds make in an empty sky; they vanish as fast as they appear. Watching the great rinpoches performing sacred rituals, it takes a sharp eye to witness the mudras as suddenly they appear and vanish in all that fluid motion. Yet they do appear, just as their sacred sand mandalas are formed and then swept into the sea, the gesture of offering . If they have no permanent presence, then what's the meaning of their existence or our own? We might just as well ask why there are flowers or rainbows. Everything is a sign of something, but what is it that catches your personal eye, that speaks to you? And I am not talking about superstition, but rather perception and intuition, learning to trust what we see at first glance rather than second-guessing what we see. It is all there in a micro-second flash of identification. Trusting what we see, as mentioned, is what this blog is all about. Learning to live and find guidance in the many subtle signs around us takes time. I have been doing it for as long as I can remember. Trusting what I see without the safety net of overthinking is what it takes. Signs appear in those split-second moments when we can relax enough to admit them, but they do tell. And they can mean so much. They guide, they warn, they confirm, and as the Ven. Chögyam Trungpa used to say, "First thought, best thought." Take advantage of your intuition. It waits on you. Since I am a kind of slow learner, often I have to see an identical sign repeated more than once. Twice usually does it, but sometimes it takes more to get my attention. What is it trying to tell me? I finally acknowledge what is by them the obvious and take remedial action or whatever is indicated. The old saying "Fool me once, shame on you, fool me twice, shame on me" holds true here. We am expected to act on what we see, and to not just ignore it. And this reading of "signs" is not just for the very few or for our "psychic" cousins. It belongs to all of us by our very nature and, if it is dormant right now in much of society, this was not meant to be the standard. It would be like driving a car without headlights and mirrors. But we may have to learn to use our intuition just as we learn to drive a car. The cosmos has already issued each of us a license to read sign language for the duration of our lives. And we give signs too! Reading signs differs from the nagging comments from my Self in that there is always a ring of truth to perceived signs as opposed to the vested self-interest. Intuition whispers, while most self-references are like white noise. It is best I ignore the noise. In a sense, the world is alive with signs. Everything can be still around me yet I can see the signs when they appear, winking and blinking in space, signaling me, waking me up, guiding me. When I think about when I first began seeing them, I go way back to when I was just a little kid studying nature. Even then I was reading nature's signs all over the place. I was aware of the tiniest movement around me. I would go sit in the grass in the woods. It would take time, but after a while what was still around me would began to move. Tiny critters crawling, bees and butterflies, and the world of nature would begin to appear to me. That's where it began and I took it from there. By now, reading signs is so habitual that I do it without thinking. Actually, I always did it without thinking, because thinking only blurs what I am pointing to here, these signs. I am thankful to have learned what is called "Insight Meditation," a Buddhist technique that is a kind of finishing school for sign reading, because beneath the outward signs is what we call the intuition and insight, and, as the saying goes, "When intuition speaks, we listen." That is where all the creative ideas in the world come from. Of course every idea, every thought in the world originally came from the mind, which is why the Tibetan Buddhists call the mind the "Wish-Fulfilling Jewel?" Signs are the body language of reality. There are no empty gestures.